Pop/dance singer/songwriter Shuree grew up in a semi Christian home in Columbus, Ohio. After a while of living with her parents’ drug use and abuse, Shuree’s family found Christ when she was four years old. However this was short lived for her parents, but Shuree actively made her choice to follow Jesus despite her parent’s opinions on the matter. 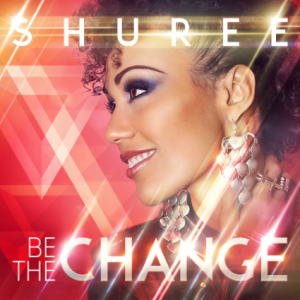 Now, Shuree’s relationship with her parents’ is mending, and her calling into music and motivational speaking, and success of her independent 2012 album One Girl Can Change The World caught the attention of BEC Recordings. The label signed her, and now the EP Be The Change drops next week. With a bubbly, contagious and joyful personality, shining through in her upbeat pop and danceable material with inspiring lyrics, Shuree’s label debut is something to savour, and a privilege to listen to, to hear Shuree’s testimony, as we glorify God and be the change to those around us. The mid tempo pop title track, and radio single, is first up, and is driven by explosive synth and keys, and driving guitars, featuring a theme that needs to be heard in today’s society. As Shuree emphatically declares across brilliantly played instruments, and a catchy beat, that we need to be the change in the world that we want to see, to combat or at least counteract the tragedies and lies we see in the news everyday (which will discourage even the most hopeful of Christians); I am moved and encouraged, as I actively make steps to share my faith, and be a light in the darkness to those who don’t know Jesus. Reminding me of Matthew 5:13-16, Shuree reminds us to ‘…don’t be afraid to be the change He started inside of you, now let it shine through…’, this inspiring toe tapping melody will definitely be on repeat on my iTunes playlist for a long time! All throughout the rest of the EP, Shuree works to her musical strengths, which is pop, sometimes driven by the keys and other times led by the guitar. There are no slower paced ballads (in the piano led sense- that have no electronics in them), but maybe she’s reserving them for her full length label debut album! “Superstars” though is one such track that is as close to a ballad out of the tracks in this EP (although it later transitions to a straight up pop anthem), and is led by a brilliant combination of guitars, drums and piano that has me nodding my head and singing to the infectious beat. Thematically about how each one of us is made unique, and each one us is needed in God’s plan, so that we can share the gospel in each of our different spheres of influence, the theme of being the change of the world is present in this track as well. As Shuree majestically cries out that ‘…we shine because You shine, lay a spark in the darkest night, we are, we are Your superstars, Your superstars, and even when the sun goes down, Your light will still be found…’, we are given a reason to sing out God’s praises from the top of our lungs, as we make His make famous, and be the light for those in need! Another track that shows off Shuree’s exquisite and distinct voice, and is another ballad-y type song is “Listen To Your Heart”. A personal and emotional song of Shuree’s faith in Jesus, the chorus moves into a worshipful setting when Shuree emphatically declares eternal truths about Jesus, and that ‘…You say I’m strong enough, Your power lifts me up, when I listen to Your heart, You say I’m good enough, I’m loved no matter what…’; a refrain that is sure to bring a smile and reassurance to anyone, that we are not alone in this life, and that Jesus has our backs no matter what. The synth and electronic led pop tune “Heartbeat”, another promotional single, features Shuree passionately proclaiming that Jesus is our heartbeat, and that He is the only thing in this world that can ever satisfy us, as we ‘…step to Your groove, follow Your feet, dance to the rhythm You’ve given me…’; while the mid tempo remix-y ballad/pop song “Louder Than Words”, led by pulsating keys and ambient synth, is thematically about actively making sure that our actions reflect the words we proclaim, what we believe, and the eternal truth of Jesus being our Saviour! Too many times have people fallen into the trap where our actions and words do not align, and Shuree reminds us that what we believe should be reflected in our actions, otherwise our belief is not going to be believed by non-Christians and those we share God’s love to. The final track “Runaway” ends proceedings with a gospel themed upbeat melody about God asking us to run away from our old life and into His arms and into the new life that Jesus offers. Sounding similar to Natalie Grant in this track, Shuree employs gang vocals, hand claps, and the guest vocal of Manwell Reyes from Group 1 Crew, to invoke a sense of a celebratory party. That’s exactly what the Christian life is- a party because Jesus set us free, and it’s nice to be reminded about this fact! Well done Shuree for releasing an enjoyable EP! “…A lot of people have lost hope, have lost purpose, and I can speak life into that. My story is what God has called me to share and the music is my avenue for doing that…” A well thought out, produced, and sung EP, which is only a taste of what is to come for Shuree (the only grievance I have is that the album is too short! ); this BEC Recordings artist is well on her way to becoming a star, and a voice for young people to be the person God wants us to be. A stand out EP in 2014, you will not be disappointed with Be The Change! I pray that these six songs help us want to be the change in our community or wherever God has placed us. Well done Shuree, I am definitely and eagerly anticipating your next albums! The album releases next week, but you can listen to the album now on New Release Tuesday in its entirety!